You are here: Home » Life Issues & Bioethics » Contraception & Abortion » Our Lady of Guadalupe, We Need You More Than Ever! Hundreds of millions of people around the world today will celebrate Masses to honor an appearance of the Blessed Mother made 481 year ago. December 12, 1531 Our Lady of Guadalupe put an end to the Mayan culture of death. Mary was the woman, clothed in the sun, with the moon at her feet, who transformed the brutal culture of the Mayan/Aztec people. For thousands of years the evil of human sacrifices was practiced and perfected by the Aztecs and other Indian cultures throughout Mexico, Central and South America. On December 12, 1531 that culture of death was about to be crushed with a simple miracle. The prelude to this miracle came 11 years before, when, on Good Friday, April 22, 1519 Hernán Cortés, accompanied by 11 ships, 473 men, 13 horses, and a small number of arms and cannons, landed in the Yucatan Peninsula in southeast Mexico. Cortés and his men had many motives for conquering these lands. Paramount among them was to end the practice of human sacrifice. There were gold and thrill seekers among the Spanish, but the brutal culture of death that demanded the killing of enemies, friends and family shocked Cortés. Thinking him a god, the Aztecs attempted to appease him by inviting him to witness the slaughter firsthand and serving powdered human blood in their first encounter. Later he and his men watched the Aztecs cutting out and eating the hearts of their victims, dismembering them and pitching their body parts off the tops of stone pyramids to the cheers of the crowds below watching these gruesome murders. No will ever know exactly how many were humans were sacrificed over the course of thousands of years throughout what would become Mexico. By the late 1400’s, during the reign of the Aztecs, each community throughout Mexico was required to offer one thousand people each year to their god Huitlopchtli, the god of death, sun and war. The Aztecs had hundreds of gods that demanded human sacrifices each year. One Mexican historian estimated that one out of five children was sacrificed. Sometimes entire tribes were exterminated by sacrifice. Sacrificial victims came down the long stone roads leading to the giant pyramids. Millions either climbed, or were forcibly carried screaming, up the steep steps to the top of bloodstained stone platforms. The Aztec “priests”, dressed in satanic-looking dark costumes, would hold the arms and legs apart and bend the victim backwards over convex slabs of stones. As the crowd cheered and the deadly drumbeat intensified, one of the priests would take a sharp blade of black volcanic glass and gut the victim open. As the blood sputtered out, the heart was still beating as it was held up for the crowd to see. Sharp stone blades would then cut off the victim’s head, arms and legs. The heart was eaten voraciously by the killers atop the pyramid as the rest of the body parts were hurled down the steps of the pyramids to the crowds below. Sometimes thousands were executed over the course of several days. Cortés and his men, seasoned, hardened battle-tested soldiers had never imagined that there could be such an advanced society living with so great an evil. It was beyond their comprehension. Some of the Spaniards, captured in the battles to come, became victims of the human sacrifice they were determined to eradicate. It took three years of warfare to conquer central Mexico and begin the end to this culture of death. There were many insurrections and attempts to return to the “old ways” and incidents of human sacrifices for nearly 10 year after official hostilities had ended. Nearly 12 years after the Spanish landed and nine years after the end of hostilities, there had been only limited success with converting the Aztecs and other tribes to the Catholic faith. By 1531 there were few converts. The Spanish tried to translate, for the most part unsuccessfully, the tenets of the Faith to a people who did not have a written language. 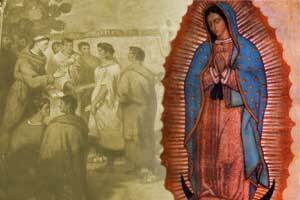 Suddenly, and quite unexpectedly for all involved, that all changed 481 years ago today when a convert to the faith, Juan Diego, encountered Mary, the mother of God. Juan Diego, a Nahuatl Indian, was a widowed convert to Roman Catholicism on his way to Mass on December 8, 1531, Mary’s Immaculate Conception feast day. For several years Juan Diego, then in his mid-fifties, got up before dawn and walked fifteen miles, one way, to attend Mass. The stone church he attended (which still stands in Mexico City) was erected from the dismantled Aztec pyramid stones. As Juan Diego walked passed by Tepeyac Hill, a few miles from church, the sky became bright and he heard singing on top of the hill, like the songs of various birds. Juan Diego rushed the final miles on foot and waited for hours to see Bishop Juan Zumarraga. The friars were reluctant. After all, Juan Diego was a poor Indian with sandals, a walking stick and no appointment to see the bishop. After waiting patiently, Juan Diego was finally ushered in. When he related his story to Bishop Zumarraga, Juan Diego, through a translator, was told that he needed a sign to prove that this account was true. A series of other events happened to Juan Diego over the next three days that would take too long here to explain, but then on December 12, 1531, Mary provided a sign that convinced the bishop that Juan Diego spoke the truth. When Mary appeared to Juan Diego that day, she directed him to pick some flowers from the top of Tepeyac hill, and to gather them in his tilma (a long cloak) to present to the bishop as proof of her miraculous presence. (The roses he found only were previously known to grow in Spain, not in Mexico, and certainly not in the dead of winter.) Juan Diego did as he was asked and the Blessed Mother even helped him lay the flowers in his tilma. Our culture, in which Satan has convinced many of our people that slaughtering their most innocent citizens in their mother’s wombs is a basic human right, needs another wake-up call. In the Aztec society the brightest, most well-trained leaders and the entire culture was convinced of the need to kill innocent people atop those pyramids for thousands of years. In our society today some of the brightest, best-trained leaders have passed laws that allow for the slaughter of our most innocent. Today in our culture you have one-third chance to be slaughtered once you have been conceived. Once you are killed your body parts are farmed out to be used for everything from cosmetics to biomedical experiments or your DNA can serve as the growing agent for childhood vaccines. Our society uses and depends on the slaughter of tens of millions of innocent human beings. It cannot survive that way. Jesus sent his Mother once to triumph over the serpent-god that the Aztecs, Mayans and other Indians were worshipping, and to put an end to the brutal human sacrifice that was being practiced, ending that culture of death once and for all. We can surely trust that Our Lady will intervene for us today and overwhelm the darkness with the brightness of her presence once again. On this memorial of Our Lady of Guadalupe, let us pray for her intervention to bring an end to the deadly errors in our society. Hail Mary, full of grace! Pray today that Mary, the protector of the Americas and the unborn will help defeat the modern culture of death.